The latest news & analysis of urban design, architecture and heritage and conservation in the built environment. Detailed plans for the landscape and appearance of the residential phases of North Street Quarter have secured consent. With a simple redevelopment scheme, Cathedral Lanes in Coventry has been changed from an inward looking shopping centre into a focal point for the city's main square, finds Geoff Wright. Rather than confining children's play to limited areas of a housing estate, streets and other public areas should be seen as places for fun, writes Ben Kochan. 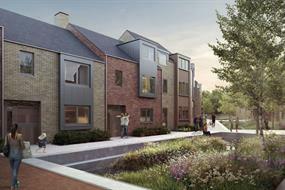 Major Peterborough extension at The Hamptons enters final phase with approval for development of 350 homes. The town's bus station will be replaced with a new transport interchange, rooftop park and homes as part of wider regeneration.